The Reds legend wonders what kind of attitude the Brazilian will have after not making a move to the Spanish giants. LIVERPOOL SHOULD HAVE sold playmaker Philippe Coutinho to Barcelona, according to club legend Graham Souness. The Reds turned down three bids from Barca this summer, even after the 25-year-old playmaker submitted a transfer request. But Souness, a former Liverpool midfielder and manager, has questioned the kind of attitude Coutinho will have for Jurgen Klopp’s side following such a high-profile transfer saga. “Going forward, what sort of Coutinho is Jurgen Klopp going to have around the place?” Souness wrote in The Times. “There will be some players in the dressing-room who are not terribly happy with him and everyone will be keeping a close eye on him. “Will he still be the same committed Coutinho from past seasons? Only he can answer that. Coutinho, who has not yet appeared for Liverpool this season, is currently with Brazil ahead of Tuesday’s World Cup qualifier against Colombia. Email “Souness: Liverpool should have sold Coutinho to Barcelona”. 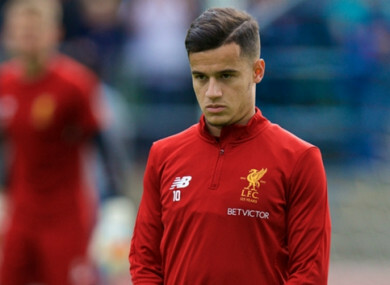 Feedback on “Souness: Liverpool should have sold Coutinho to Barcelona”.